I have always envisioned periodization to look like gradual builds towards a peak right before an A event, followed by a valley and another peak...wash, rinse, repeat. Last year, mine reached one peak and then steadily declined even though I had 3 A events total. This year, I’ve reached a plateau and have stayed there since April. My first A race was early June and second was in early July. For what it’s worth, I felt better physically last year than I did this year. 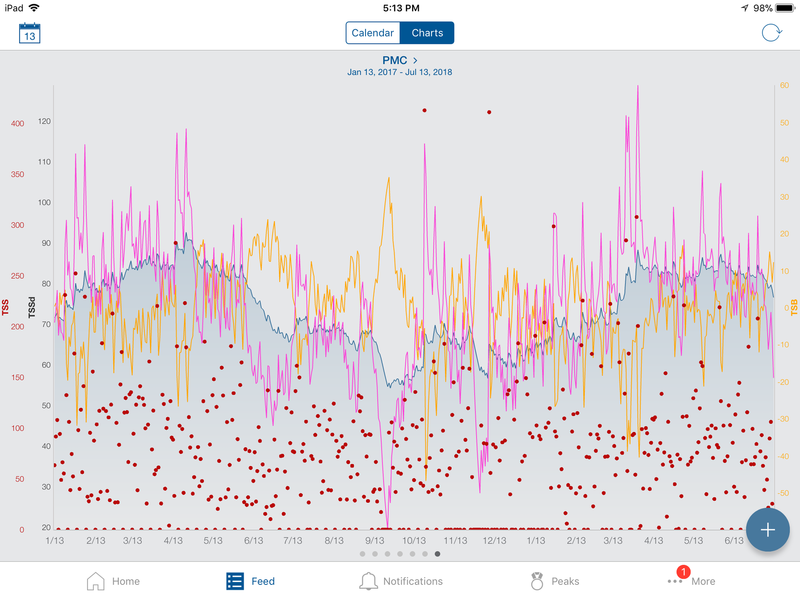 What should a properly periodized training plan look like in the PMC chart? What do you mean by peaks and valleys? CTL, ATL, or TSB? CTL should not dip significantly the weeks before your peak event, but you should be tapering while keeping the intensity high so your ATL comes down and your TSB(CTL-ATL) comes back up to 0 - +15 depending on where you race best. I think it's going to depend a lot on the athlete, the experience, and the events. I'd be more concerned with performance than what the chart shows. With CTL declining, how did you feel in your last A event? Still good? I've found that I can still race crits really well with significantly lower CTL, but road races start suffering pretty quickly. Here's my chart from 2016 where I did a better job of periodizing. First big block was in preparation for April and May races, CTL peaked at 100 before dropping to 89 by the end of the racing block. Had a few really good races. 2nd build was in June for Elite RR and Crit Nats. 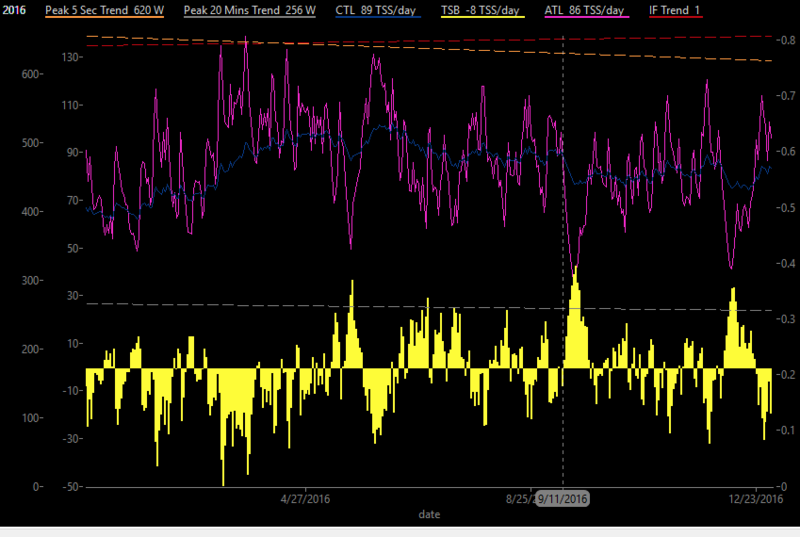 CTL peaked at 104 in mid June and dropped to 89 again by the event date on July 2nd or whenever. Had really good races getting 11th in the crit and 48th or something in the RR, though I still got dropped 100 miles in to the RR by virtue of never doing races anywhere near that long. Never got above 92 for the rest of the season but residual fitness and race sharpness carried me through to a couple of more wins and podiums. Sort of like this as an example...this is how I imagined it should look. Here is my PMC from Jan 2017 to today. I felt physically better through out all of last season than I have so far this season. Notice the steady decline in 2018 after my first A race in early April. In 2018, CTL plateaus. My first A race was the secon weekend in June. Last edited by Poonjabby; 07-13-18 at 04:24 PM. My season actually started with Joe Martin (early April) in 2017. My secon A Race was Tulsa tough first weekend of June. This year, my first race was Snake Alley (Memorial Day) and my second was Natural State (first weekend in July). Last year I felt great! This year I feel flat, sluggish and just less power to push the pedals. Haaa. I couldn't imagine a worst first race. Especially with the 95 degree temps this year!